Site Manager Software with Outstanding Tools! 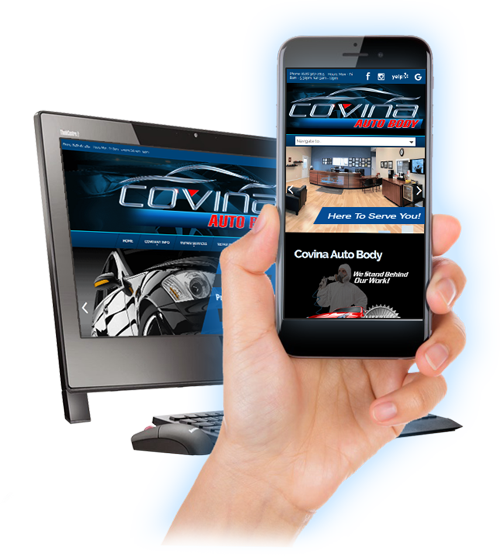 Our core service is website design for auto body shops / collision repair centers using "Responsive Design" technology to ensure users on any device can have a hassle-free experience. With our unique website package, we will build you a customizable, professional website that includes our powerful site management software. We also provide search engine optimizing services and for a limited time, we will throw in a FREE logo design service! If your website is not mobile optimized, you could be missing out on a lot of sales! It's estimated that over 70% of users these days are on some type of mobile device as opposed to using a computer or laptop. Moderm websites need to work on smart phones, tablets and other mobile devices! We use technology called "Responsive Website Design" which makes websites work flawlessly on any device and screen size. If your website is not built using a "Responsive Design" then customers may jump out of your website and visit another body shops website. Check out our Auto Body Website Design page for more information on our mobile optimized web design services. We make it easy for you to decide on which company to use for your shop's website, by offering a 100% completely free website to demo for 10 days. We will make you a fully customized website with with all the bells and whistles including access into our website management software. There is no obligation and no cost. Take your FREE test drive today! We have created literally hundreds of logos for body shops over the last 21 years! Our professional logo design session gives you several initial concept designs to choose from which can then modify any way you wish. The finalized logo is provided in formats that can be used for signs, apparel, the internet, print documents...virtually anything! SPECIAL! Sign-up for a website and get your logo for FREE!